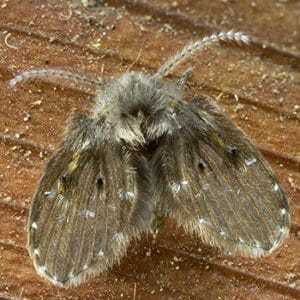 Moth Fly adults are 1/16 to 1/4 inch long, dark brown to black and very hairy. Even their long antennae are hairy and their pointed leaf-shaped hairy wings are easily recognized. Mature Moth Fly larvae are 1/8 to 3/8 inch long, dark brown to black, cylindrical shaped though somewhat flattened on the underside. Moth Flies are most active at night, are attracted to light, and usually found in kitchens or bathrooms. Moth Flies breed in the liquid in drains, septic tanks and dirty trash cans. Moth Fly larvae eat the algae, bacteria and sludge found lining drains, in dirty trash cans or under slabs or in crawl spaces with leaking plumbing. Adult Moth Flies eat nectar and polluted water. The adult Moth Flies will be found emerging from drains, flying around lights or resting on vertical surfaces near their breeding site. The larvae will be found in liquid containing the algae, bacteria or organic matter they consume. Simply cleaning the drain with a liquid drain cleaner will not remove the bacteria Moth Fly larvae feed on. Mechanically cleaning the drain with a stiff brush, cleaning agent and very hot water all the way to the trap is required to remove the bacteria, algae etc. Microbiotic drain cleaners can be helpful to minimize Moth Fly issues when used regularly. If the source of the Moth Fly issue is a plumbing leak under the slab, it may be necessary to break a hole in the slab, repair the plumbing and remove and replace the contaminated soil.